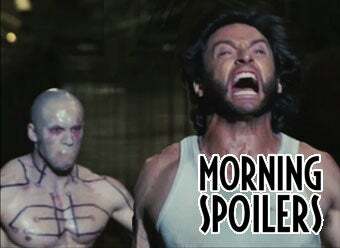 Captain America set pics, Torchwood hints, Super 8 creature secrets, and Olivia's ultimate discovery on Fringe! Spoiler bonanza! Captain America set photos reveal a key turning point. Super 8's mystery creature is...Elvis? RTD talks Torchwood. Cameron says Avatar 2's no Matrix Reloaded. Smallville's Supergirl suits up! Plus Fringe, Transformers, Supernatural and All You Need Is Kill. Story centers on a new recruit in a war against aliens who finds himself caught in a time loop in which he wakes up in the past after having been killed on the battlefield. As the soldier's death and resurrection repeat, his skills as a soldier grows as he attempts to change his fate. I'm mapping out the story line right now, so there's a proper arc that plays out over two films, but (it) buttons nicely at the end of two, so you don't get this horrible second-act Matrix feeling - you know: 'I've just sat through a three-hour movie and f**k all happened at the end! When you hear that the new series is going to be "international," it doesn't mean our heroes are going to be swanning off to China for no reason, says Russell T. Davies. There'll be "proper reasons" for people to be separated by oceans, and it'll show how much smaller our world is nowadays. "There's some really interesting global stuff about the story." He says when the story begins, Torchwood will still be deprived of its former status and will still be "terrorists on the run, practically." Except that time has passed, and everybody's forgotten Torchwood ever existed. It's buried. "Torchwood is their designation now — it's who they were, and what connects them." And he says that when the Doctor closed all the cracks in the universe at the end of "The Big Bang," he thoughtfully closed the Rift in Cardiff as well. And Ianto is definitely dead. You really see her as Supergirl. Not the whole outfit, but her wardrobe will have evolved even a little more than Clark's. She's less Kara and way more Supergirl.